I feel a cold coming on. I woke up three times last night – idiot dogs – and I had that thing, when you’ve sweated but now it cooled off. My throat hurts. I’ve just gotten over the chronic throat soreness, and here we go again. And my brain is fuzzy. I pulled out the big guns and took Advil Cold and Sinus. It should give me a few hours of jittery productivity before I crash. Today is the dumpster day. Today the dumpster arrives and it marks two week deadline for packing and throwing things away. I’m getting rid of my dishes. They are perfectly good dishes. I bought them when we moved in, seven years ago at Walmart. We needed dishes, we didn’t know where to shop, we saw a Walmart while driving around, I walked in, gave them $25, and walked out with the dishes. Boom, done. They are a bit scratched up, nothing a bit of Barkeeper’s Friend won’t fix. The scratches are actually scuffs from silverware, and BF has oxalic acid in it, which dissolves mineral deposits. Yay, chemistry. My father saw me cleaning them and became terribly excited that I remembered basic chemical reactions, and then told me the story of Niels Bohr for the one thousandth time. In 1940 the Nazis rolled into Copenhagen, and two scientists, Max von Laue and James Franck, knew their Nobel prizes, which were made of 23 Karat gold, would be confiscated. They sent them to Bohr, who was a known opponent of Nazism. Bohr realized that his institute would be searched and so he had a dilemma. How to hide the medals? Gold is a noble metal. It’s called so, because it’s mostly nonreactive. That’s why it can be found in the ground in a pure form. It doesn’t rust, it doesn’t react to anything, and if you throw most solvents on it, it just sits there and waves hi. However, there is one special solution called aqua regia, the royal water, which is one part nitric acid to 3 parts hydrochloric acid, that dissolves noble metals. Gold takes forever to dissolve, but when the Nazis arrived and searched the institute, the medals were gone. The part my father loves the most is that after the WWII ended, Georgy de Hevesy, a chemist who worked with Bohr, managed to precipitate the gold and they sent it back to the Nobel Commission, which recast the medals and gave it back to their owners. That’s the end of the story, and Nazis are evil. Here is a pretty typical plate you can buy in Russia. It happens to be a French import, but this one has all the sizes, so we are going with that. It’s 25 cm or 9.84 inches across. I measured the Wal-mart plate. It’s 11 inches across. There is an 11 inch plate in that particular set, but it’s what Russians call podstavnaya tarelka. Plate that goes under a deeper plate of soup during dinner, so you don’t make a mess. It never occurred to me, but we’ve been eating from under plates and you can fit a lot more food on the under-plate than on a regular size plate. So I am using this move as an excuse to get rid of my $25 plate set and get a new one. Any recommendations for online retailers of the pretty and not giant plate set? I live in Aus so no recommendations about dinnerware..but I found it interesting that you have the 25cm/30cm plate issue too.. 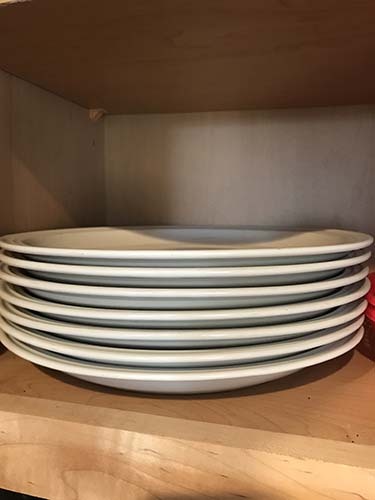 I am a dietitian and regularly counsel people about managing portion sizes to control weight, one tip being is to move from 30cm to 25cm plates. Baker IDI here is Aus has a great resource called “plating it up” which goes through this issue as well as other tips if you are interested. I am so tired of the oversized plates, bowls, and glasses that have been … fashionable … these last many years. Thank you for suggestions with smaller sizes. They are running some deals right now online. Not sure if this is exactly what you’re looking for but the http://www.royalalbert.com/collections has beautiful china and the prettiest tea set collections. Highly recommend! Find a local potter and have them hand throw and glaze a set made and sized just for you. Similarly not online, my Mom went to Cost Plus and bought one of each plate. They are super colorful and fun and there’s no earthly reason they all need to b exactly the same. I have Noritake Colorwave dishes – pretty, sturdy, affordable, and come in a variety coffee colors and sizes. Ugh, that should be “of colors,” though I’m sure coffee is one of them. We love our Fiesta dinnerware. It comes in lovely colors (our daughter uses a set of mixed colors), it is definitely not lightweight, and it has a smaller dinner plate available. It is sold at Kohl’s and Macy’s, and also at fiestafactorydirect.com. I really appreciate the “find a local potter” idea, but if you choose commercial, you should know about http://www.Replacements.com. They have almost every pattern of porcelain, stonware, glassware, silverware, crystal ever made, and they sell it by the piece or sometimes by the set, depending on their inventory. They buy, too, all through the mail. They even have a pattern identification service. You can send them a picture and they’ll research it and tell you the name of the pattern and manufacturer. I’ve been a customer of theirs since the 1990s. They identified my maternal great-grandmother’s German silverware patterns, though they had never had any pieces in it, and keep me informed of their stock and sales of my china pattern, my mother’s German china pattern, my sterling silverware pattern, my everyday stainless steel slverware, and my paternal grandmother’s silverplate silverware pattern. They have a searchable database, including photos and measurements of most of the dish, silverware, crystal, and decorative items they have listed, whether or not they are currently in stock. Very useful for looking up all the patterns the book devouring horde is happily suggesting. I recall an analysis that concluded the average plate size had increased over the past 30 years from 9 to 11 inches. It was based on plates for sale in ebay by vintage. All part of the supersizing of America! I bought my plates at a thrift store. They often have interesting sets, occasionally valuable ones, and always reasonably priced. Good luck. We bought Corelle when we first got married, it is still going strong. By the time I will probably change them I will end up with another set as they are light and are easy to handle. I always wanted to get a set of stoneware like my Mom had but they are heavy. I think you might need to decide what type of dishes you need as in do you want sturdy that can handle the dishwasher all the time and being banged around or do you want something fine that you are willing to hand wash to protect. That way you can eliminate some choices. Also I would recommend handling some dishes just to see if you like how they feel. I grew up washing stoneware dishes. When the time came to buy my own, I swore never again. I bought a set from Corelle seven years ago and have no regrets. Unless there’s company, we usually use the smaller salad plates. Since I touch them and see them 3 times a day, I decided to purchase beautiful plates. Lenox Butterfly Meadow makes me happy, they’re dishwasher safe, and they go in the microwave too! I was lucky enough to find my pattern at an estate sale at a great discount, so that made the investment easier to manage and I ended up with more peices than I originally intended to buy. Good luck finding something you like and that holds up well! BTW: ImmunoSTART from Mannatech helped my daughter get off of serial use of antibiotics for chronic sinus infections etc. It’s organic cow colostrum in tablet form. It tastes nice and works well. Though the shipping is steep, the product is worth taking the hickey. I rarely endorse products by brand, but quality varies by brand and I really want you to get well. Lenox Butterfly Meadow also makes me happy. I have a few pieces (trivets, spoon rest, salt & pepper shakers) because my family is hard on dishes, but I really do like them. I visited Pompeji’s exhibition and they had dishes on display. Bowl where they cooked food for the family was the size of sugarbowl. Individual plates were the size of a plate that goes under coffee cup. It was insane how small they were. And the “dead bodys” there, forever frozen ib death, were all skinny. I know romans used to have food orgies and they were fat- but it wasnt so in Pompeji. 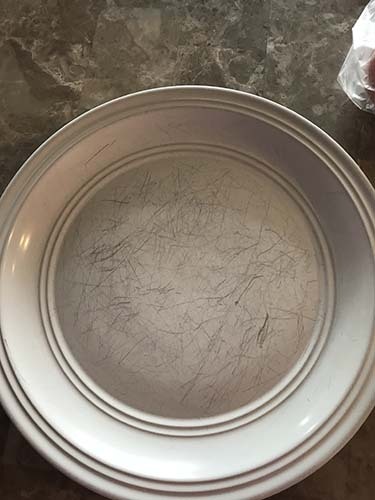 Dinner plate 10.5″ or Salad plate 8.25″? We use the salad plate for our meals unless we have company. Admittedly the 1 inch rim sees the occasional use but it has helped reduce our consumption. It also helps that our kids do not live with us and the cook has gotten a better handle on portion control. “Set mismatched fine China floral plates” (search terms) off eBay. Mixed with blue willow, Spode blue room, Wedgewood, and some from garage & estate sales. Some kinda match, color-wise. But now I’m looking at Lenox & some potters mentioned in the thread. But I can try 1 at a time! About 10 years ago I decided to go with white bone china. I was tired of chipped plates and changing styles. Advantages of plain white bone china: 1. Bone china doesn’t chip. 2. Bone china doesn’t chip. 3. Bone china doesn’t chip. 3. You can go with whatever color scheme that you like by just switching up table clothes or serving dishes because your dishes are white. 4. Bone china doesn’t go out of style. 5. Did I mention that bone china doesn’t chip? You could go crazy and get a fancy set or go to the Home Goods store and score a decent set for a low price. I opted for a relatively plain set. It is a work horse. Microwave safe, oven safe, dishwasher safe. No chips. It does fancy dinners and low-key dinners. I have one set of dishes that work for every occasion. Enjoy plate shopping. I also really liked your dad’s story. Fiestaware is awesome. They have a 5yr warranty from chips, made in the USA, and dishwasher/microwave safe. My set has moved with me 4 times in the last 6 years and I have not had a broken piece. Best place to buy sets is from Kohls. They regularly run specials on them. Last week Dillards actually beat Kohls and Macy’s on Fiesta Wear. 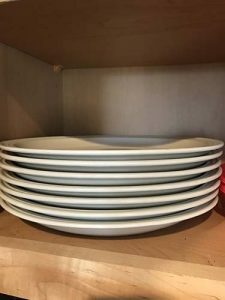 I like the Hadley Pottery plates (we use the 9″ for portion control dinners and the 11″ for dinner with guests), http://www.hadleypottery.com. They are made and glazed and sold in Louisville, KY. Also, Simon Pearce has a made in Vermont pottery line: simonpearce.com . I do not know those dimensions. You could try etsy or Amazon handmade. Fun project! I’m from West (by God) Virginia, so I of course have Fiestaware (it’s made in the northern panhandle, and I’ve been to the factory). I adore it. I went with every plate is a different color (when small people come to visit, they get to choose who gets what color plate). I use the luncheon plates for dinner most of the time. I also have a set of china that follows a similar pattern. When we got married, I told my family to pick a single setting in a pattern they liked. Then whenever we’d go past a china factory outlet, I’d pick up single pieces on sale that I liked. This works especially well since I asked for a single setting of each of our grandmothers’ china sets from the family member who ended up with their china. This means I can easily use those settings for fancy dinners, since they “match” as well as anything else. When ever My husband or I feel a creeping crud approach we reach for a tube(or several) of Oscillococcinum, some Ascorbyl Palmitate, and depending on other indicators, straight Pineapple juice, a few other Immune-boosting herbs, vitamins, and mushroom extracts. I love my bone China as well! Boxed up the first set (Royal Dalton everyday) after 15 yrs of use 5 yrs ago – not a chip or scratch on it and I’ve dropped it on granite counters and porcelain tile – I kid you not, it BOUNCED! Went with Lenox Chocolate this time and plan to switch back in another 10 yrs 🙂 (I despise chips as well :-). Good luck and enjoy shopping! 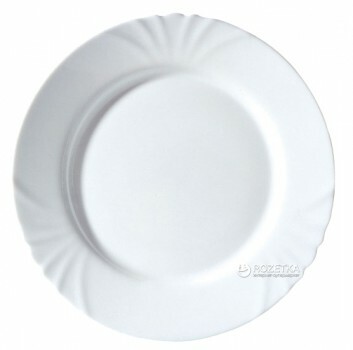 Where I live, if you had Corelle dinnerware, you’re seen as well-to-do and having fancy plates. I wish my dishes were Corelle and not melamine! Actually, if you wanted to find something really interesting – you should check out your local thrift stores, salvation army, or Women in Distress, etc… I find that they have THE COOLEST stuff in cookware and dishes. Complete sets of crystal and China in unusual patterns from modern to antique… a whole set will be under $40 even for a really really nice one. I like browsing them. There are some truly unique finds. I got a shortbread pan the other day for $2. Those are $20 to $40 online. I also got some gorgeous crystal cake serving plates (without the high lip) for about $2 each. Complete sets are sooooo cheap. And, you’ll be contributing money to charity, AND re-using perfectly good things and not contributing to more waste. I always feel really good about that. Corelle/Corningware. They last forever and don’t scratch. Also, they are not too heavy & does well in microwave. I would not recommend any Stoneware as it is horrible when put in microwave cuz they get heated way fast even though food is not heated. Bed, bath and beyond has them (you can use 20% discount) and pretty much any retail store. Even Wal-Mart carries them now. I also recommend looking at thrift stores/Salvation Army/etc or Craig’s list. I just nabbed a 12 place setting set with every accessory piece you could want for $40 on craigslist. It is beautiful and from the 1930’s and very similar to my grandma’s set. I love eating off them. Thrift stores and such are inundated with beautiful china right now because no one wants grandma’s dishes & house purging is popular right now. You can throw them in the dishwasher just don’t dry them when they are hot if they have gold or silver edging if you want it to stay on. If they break, so what and you are eating on beautiful dishes. You need to watch out for gold or silver edging if you are going to put them in the microwave. Good luck on your search. Also, you can’t go wrong with fiestaware. I don’t think they have super-sized their china.